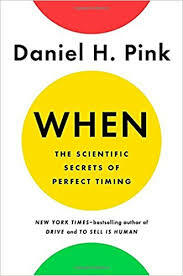 When: The Scientific Secrets of Perfect Timing by Daniel Pink was an interesting book about how timing plays a key role in how events turn out, with just a few of the examples provided in the book being that bad decisions are often made in the afternoons when someone tired and the quality of medical care someone receives driven in part by when in a doctor’s shift care is provided. It's covered that in this trough period, there's a basic decline in vigilance that occurs and being aware of this potential dip can then lead to combating it. Some ways to do that are through checklists or restorative breaks, either quick or extended, with them most effective if someone completely detached from the tasks at hand. Pink as well mentions the benefit of naps, ideally around 15-20 minutes long, and with coffee just prior as it takes about 25 minutes for coffee to kick in. Also noted is how people driven by biological clocks, with many at their best early in the day, a group known as larks, but some better later, a group referred to as owls. This assignation can also shift over time, as people tend to become owls when they hit puberty, something that negatively impacts them as many high schools start too early in the day, and then they become less owly in their mid-20s. Towards the later part of the book, Pink covers two other interesting concepts with first beginnings, middles, and endings... the ideas of starting right, starting again, and remembering poignancy at the end of something, and then the idea of syncing to others, doing things in a group such as singing in a chorus, exercising together, or doing improv-related activities.